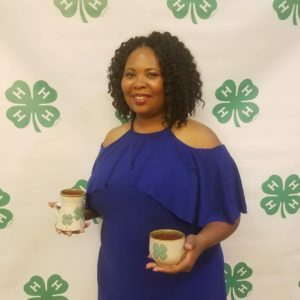 Crystal Starkes, 4-H Youth Development Agent with N.C. Cooperative Extension was recognized for an achievement during the 2018 North Carolina Association of Extension 4-H Agents Annual Conference held in Charlotte, NC. Crystal was the recipient of two awards – Communicator Award for Promotional Piece and Excellence in Workforce Preparation Program Award. The 4-H Agent received the Promotional Piece Award for her creation of the Wake Up to Agriculture report she provided to the program’s sponsors. She received the Excellence in Workforce Preparation Program for her outstanding effort by NAE4-HA members who developed a workforce preparation program in Union County for first-time potential college students and students of limited resources from schools in Monroe. The purpose of the North Carolina Association of Extension 4-H Agents is to promote the profession of Extension 4-H and youth work in North Carolina. The 4-H program is the youth education program of North Carolina Cooperative Extension, based at North Carolina State and North Carolina A&T State universities. More than 235,000 young people ages 5 through 18 participate in North Carolina 4-H activities each year with the help of 20,400 adult and youth volunteers. You can find more information on 4-H at North Carolina 4-H.
• Extension Volunteer Informational Meeting!